Japan and Singapore, together with several other Asian countries, have "controlled" tuberculosis (TB)within a relatively short period, having started from the very high prevalence before and soon after World War II. These countries can no longer be said to have a high prevalence of tuberulosis. However, their levels are still considerably higher than those of Australia, the USA and many European countries. The former mentioned countries with "intermediate-level prevalence" (ILP) of TB share many epidemiological and sociological aspects that characterize their current TB problem. EPIDEMIOLOGICAL A fast change in the situation, compared with that of many European countries, has brought about a very significant gap of prevalence of in fection between younger and older generations. It seems that in the elderly population there are many persons who were intensely infected during their youth, so that they carry a high risk of clinical development in their older age. Thus, nowadays, the peak of mortality adolescents to the elderly. 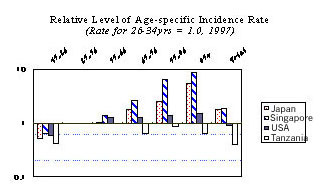 Predominance of TB incidence among the elderly is a common sign in low prevalence countries, but it is far more prominent in ILP countries, as seen in Figure 1. This generation gap of infection underlies the increasing occurrence of small epidemics of TB. In Japan, this trend was noted first in schools but now has expanded to groups of older people, such as those found in companies and institutions. thus, the speed of decline in the incidence rate of TB has slowed down recently for the population as a whole, as well as for every age stratum, especially the younger age strata. DEMOGRAPHIC The aging of the population, often also quite rapid, amplifies the epidemiological shift of TB to the older generations. This trend is further enhanced by the fact that the elderly people are increasingly likely to have illnesses or conditions that may compromise their immunity to TB. SOCIOLOGICAL TB is drifting to the less-favored socio-economic segments of the population, as seen in pocket areas in large cities with many homeless persons and day laborers. Similarly, and more extensively, it is becoming a problem among lower-income people in general, including workers in small businesses, who have poorer access to health service. Laborers coming from developing countries can additionally present such a problem but their number is still negligible in Japan. There are also increasing numbers of TB patients who have not adapted well to society, such as alcoholics or gangsters. These factors may contribute to the potential future increase in drug-resistant tuberculosis. CLINICAL As a result of the changing trends among tuberculosis patients, current TB patients are generally in more serious condition, partially due to the increased age, underlying conditions, complications and adverse reactions to therapy. They are also more difficult to manage in terms of regular drug taking. Consequently, their treatment outcome is worsening. This is further aggravated by the following. PROFESSIONAL & POLITICAL The medical profession's interest in and awareness of TB has waned prematurely. Medical professionals are mistakenly and naively assuming that their country's TB situation is just the same as that of the USA and Europe. Both undergraduates and postgraduates are poorly trained for TB. This leads to a wider delay in TB diagnosis, occurrence of nosocomial and other group infections. Additionally, government, central and local institutions often neglect TB, even though it is still the most serious infectious disease in the country. This neglect is often connected with administrative structure reform. IMPLICATIONS FOR TB CONTROL All of these problems have been experienced in the low prevalence countries. However, they are new and are rapidly catching up with the ILP countries. The countries' National TB Programs have not been well adapted for them. The casual ease or satisfaction with which people, the medical profession and the governments look at the TB problem in their countries causes reluctance in complying with any new positive move in TB, even of a program such as DOTS. At the moment, a considerable quantity and quality of human resources (i.e., TB experts) still remain in these countries. However, if this situation continues for some more time, they will be isolated and disappear, and their expertise will be reduced to a mere medical curiosity. All of these will combine to make a country's prospects for eliminating TB far dimmer. On the occasion of the Eastern Regional Conference of International Union against TB and Lung Disease in Hong Kong. 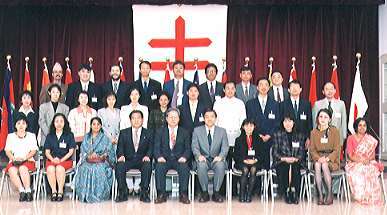 June 1999, representatives of the Asian ILP countries, including Hong Kong, Korea, Taiwan, Singapore, Malaysia and Japan, met under the technical assistance of WHO/WPRO. They had very fruitful discussion for future cooperation with each other. One of the strategies to effectively cope with the ILP situation may be social mobilization or a well organized advocacy group. International exchange among ILP countries would be very useful for encouraging and enlightening one another through exchanging experiences and ideas. It is urgently necessary and fair that the problem of high prevalence countries be widely discussed. It is also appropriate that the low-prevalence TB situation draw attention under the slogan of "re-emergence." At the same time, the problem of the intermediate-level prevalence situation as seen above should be kept in mind. This article is a summary of Dr. Aoki's lecture at the IUATLD Conference in Bangkok, November 1998. The 20th Century began when imperialism was at its peak. Thereafter came successive, violent changes such as those caused by the 1st World War, Russian Revolution, and the 2nd World War. The 20th century has been an age of convulsion. The 20th century has also been a century of great progress. No one at the beginning of this century could have possibly imagined such a great progress which would be made in areas such as industrialization, unbanization, democratization and globalization. More exactly, the 20th century could be called a century of "science". Our daily lives have been dramatically improved by the marvellous advances in chemistry, (atomic) physics, electronics, molecular biology, and those of other scientific fields like the field of medicine. Even in the area of lung health, so much progress has been made that little described about topics other than tuberculosis in the limited space here. Let me share some of these other highlights with you. First, the dramatic effect of penicillin and other antibiotics on bacterial pneumonia has changed the clinical features and epidemiology of acute respiratory infections. The etiology of ARI has become diversified, and new problems in drug-resistance have been increasing in developed countries. Moreover, it is reported that 75% of all antibiotic prescriptions are used for ARI, most of which are unnecessary in developed countries. On the other hand, four million children are being killed by ARI every year in developing countries in spite of the development of vaccines and antibiotics. As industry and urbanization progress, COPD and air pollution problems are evoking strong and wide concerns among chest physicians. Epidemiological surveys are being carried out around the world. However, it has become clear that cigarette smoking is the most consistently important determinant of COPD as shown in the large scale follow-up study by Fletcher. Meanwhile, understanding of asthma has changed from the classical "airway smooth muscle construction theory" to that of the "chronic inflammatory disorder of the airway theory". Owing to this change, treatment results of asthma patients has improved markedly recently. Also in this century, the habit of smoking tobacco spread widely through the developed countries and then the developing countries. Chest physicians have not only revealed the health hazard caused by smoking through many large scale epidemiological studies in the 1950s and 60s, but they have also participated actively in anti-smoking movement around the world. It was within the last two decades of the 19th century that R. Koch discovered tubercle bacilli, Trudeau established Sanarac Lake Sanitarium, and Roentgen discovered X-ray. It was the dawn of a new age of scientific progress in the area of phethisiology. There were so many landmarks in the field of tuberculosis research during this century such as pathological studies on "third stage theory of tbc. (Ranke)", "X-ray diagnosis and clinical studies on the development of chronic tbc. (Assmann et al), "development of BCG (Calmette & Guerin)", "development of streptomycin (Waksmann)", and "studies on epidemiology of tbc.(Styblo)". It is worth mentioning that Japanese doctors such as Oka,H, Iwasaki,T, Chiba,Y, Kobayashi,Y, and established the "endogenous reactivation theory of tbc." between 1925 and 1955 by epidemiological as well as pathological studies. Development of disease by exogenous re-infection is, of course possible, but its probability is rare. We now need to study the reactivation mechanisms of remote infections based on our present immunological point of view. Unfortunately, almost no substantial progress has been observed in tuberculin testing despite the fact that it has been over 90 years since the development of the tuberculin test by von Pirquet. A more effective vaccine, or new vaccine which does not elicit a tuberculin allergy is awaited. On the other hand, bacteriological diagnostic methods for Mycobacteria have advanced strikingly in the last ten years. For example, it has become possible to detect very small numbers of tbc. bacilli in a few hours. DNA fingerprinting has also made it possible to determine whether the bacilli are originated from the same strain or not. The progress of detection and the identification methods for Mycobacteria are among the most glorious achievements of this century in the field of tuberculosis. They will no doubt have a greater impact in the near future and into the next century. The biggest landmark of this century in the field of tuberculosis is, of course, the development of chemotherapy. There is no other field which has had so great impact. Such rapid progress in tuberculosis chemotherapy become possible through both the development of the murine model to examine anti-tuberculosis activity in vivo as well as the development of the research methodology of randomized controlled trial in the 1940s and 1950s. Tbc. doctors can be proud that the results of randomized clinical trials were applied not only at clinical settings, but that they were also applied effectively National Tuberculosis Program (NTP) in the world. Development of the NTP strategy, mainly by WHO and IUATLD, has been another great achievement of this century. Since the introduction of the DOTS strategy in 1995 by WHO, the NTP has especially become increasingly active and effective in many developing countries. The forerunner of the IUAT was established in 1902 in Berlin and the IUAT was founded on October 20, 1920. Since then, nearly 80 years have passed. During these years, the number of member countries has increased from 31 to 110. The IUAT extended its activities to cover lung diseases and community health in 1973. The name of the Union was changed to IUATLD in 1986. The Union has continued to take the leadership in promoting scientific research, improving clinical work, encouraging international cooperation, and activating a worldwide tuberculosis control program. In conclusion, three characteristics or problems can be pointed out. Firstly, as science has developed from the observation of macroscopic to microscopic findings of the disease, then to molecular biology, science has also tended to at times lose sight of the whole picture. Secondly, although science has searched vigorously and quite successfully for universal principles over the last 100 years, exceptions to findings which also sometimes provide valuable truths were neglected. Thirdly, the divergence between scientific finding and actual situations is widening particularly in developing countries, due to the rapid and marked progress of science in this century. It is strongly hoped that the lung health of the world's people will improve in the future. 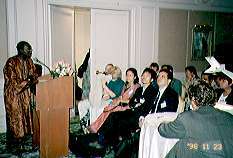 The Workshop, "DOTS: Experience of Different Countries"
was held on 23 November 1998 before the IUATLD meeting started in Bangkok. It was jointly organized by the Research Institute of Tuberculosis, JATA and Royal Dutch Anti-Tuberculosis Association (KNCV). Countries and subjects of presentation were as follows: Bangladesh (urban DOTS), Nepal (success results in flat areas and hilly areas), Philippines (utilization of village health volunteers), Thailand (treatment results from TB/HIV infected patients), Yemen (development of the DOTS programme in city areas), Kenya (role of private sectors), The Gambia (rural DOTS), China (large scale programme, -role of village doctors and incentives), Indonesia (weekly DOTS with health volunteers) and Vietnam (DOTS for homeless people in urban areas). What I learned is that we have to develop DOTS to suit different situations. Results rather than methods would determine whether or not a programme was successful. We should make full use of our imaginations. About 60-70 persons attended the workshop and there was a lively discussion. Many Kiyose alumni were among the presenters and within the audience. It was an important moment for all attendants to share results, findings, and success stories with the eagerness of persons who are committed to the tuberculosis programme. We were all inspired by the presentation and discussion. The approach to TB infection control issues is hierarchical. The most important controls are administrative, followed by environmental controls, and finally personal protective devices. (A) Administrative controls: the first thing that must be done is (1) to assess risk and develop appropriate written protocols based on risk assessment, (2) to implement and enforce effective work practices to prevent transmission of TB, and (3) to educate, train, and counsel health care workers about TB, and (4) and to screen health care workers for TB infection and disease. (B) Engineering controls: to prevent the spread and reduce concentration of infectious droplet nuclei by (1) using direct source control via local exhaust ventilation, (b) controlling direction of airflow to prevent spread of infectious droplet nuclei into adjacent areas, (2) diluting and removing contaminated air via general ventilation and (3) cleaning the air by air filtration or ultraviolet germicidal irradiation. (C) Respiratory protection (wearing high efficiency masks) Use personal respiratory protection in settings where exposure to TB bacilli can still occur, such as: TB isolation rooms, rooms where cough-inducing or aerosol-generating procedures are performed, etc. Dr. Fujiwara was invited to visit Airin District in Osaka City on 12 February. The case notification rate of smear positive TB cases was 216 per 100,000 population in that area in 1997. It was the highest in Japan. The main reason for this high incidence rate is that there are many homeless people there and it is a mobile population. Most of residents are daily labourers. They come from all over Japan and stay there, mainly in rented rooms, to look for jobs. Hundreds of homeless people also live in tents on streets or in parks. Dr. Fujiwara went around the area and observed the people. She was asked her impression on the area. Her reply was that situation was very common to that in New York City. On the same day, she met high officials of the Department of Health, Osaka City and gave lectures on infection control in hospitals and DOTS. Then the Osaka City government pledged to introduce DOTS in Osaka. Now it is in the process of preparation. Tuberculosis control courses have helped me a great deal in the field of tuberculosis control as well as other aspects. For that, I would like to share my experiences in my country where I work for tuberculosis control at the central level and also as a member of PPTI (The Indonesian Association Against Tuberculosis). WHO declared that more than 50% of the world cases of tuberculosis are in Asia. Indonesia contributes as the third largest number among six countries. In 1992, a Household Survey for Indonesia noted that tuberculosis is the leading cause of death among infectious diseases and the second largest cause of death following cardiovascular illnesses. After the Indonesia-WHO Joint Evaluation (1994), we adopted the DOTS strategy and revised NTP started in 1995. It is not easy to cover and especially manage a program throughout a country with a population of 200 million spread over more than 17,000 islands and islets (figure of 1995). Training the 27 provinces and 313 district's health officers is difficult (1996) as well. Due to the current economic crisis, an increase of tuberculosis cases is being expected. At present the Revised NTP has only been implemented at Health Centers that are expected to cover 1/3 of the expected cases. Effort has been increased to meet all sectors as one team to challenge the disease. Another obstacle is inviting the private sector as well as all health services units (including hospitals) to work together. As we know, DOTS strategy is not as simple as it seems. Recording and reporting systems are usually rejected as burdensome to clinicians, private clinics and hospitals. Sputum examination is an old fashioned method and not favored by lung specialists. A wider use of DOTS more was successfully implemented only in Central Sulawesi province, which was able to include hospitals and private doctors in the program in 1997 with an 85% conversion rate and 84% cure rate (1997). As a board member of the association (PPTI) I had the opportunity to take part in JATA cooperation with PPTI (The Indonesian Association Against Tuberculosis) on DOTS strategy. The project started in 2 PPTI clinics last November 1997. One represents clinics with hospital medical record systems and the other represents general clinics. X-ray facilities at the two clinics are also being used, following microscopic sputum examination. The NTP standardized recording and reporting system is also being used in addition to the present clinical records used at each clinic. Health education is also one important part for the patients and treatment observers. After one year of cooperation we hope to write a success story based on the results. Already, there has been an improvement. The positive rate or proportion of 381 new smear positive cases among suspects examined was 13.6%; a big improvement compare to 0% one quarter before the project started. The high conversion rate for patients registered from Dec. '97 - Dec. '98 was 91.4%. So far, our cure rate for 89 patients registered from Dec'97 - March'98 has been 83.9%. At the same time, five patients have died, 1 has transferred and 6 others have been failures. For our case finding, 59% were male compared to 41% of female cases. We still have more male than female cases. Most of them (78%) are in the productive age group. This will be a strong factor for advocacy from an economical viewpoint. From cohort quarterly results, an increase in case findings was followed by a steady conversion and cure rate. A contract system with the patient right before starting treatment has been a unique method to keep patients on treatment. Using family members as treatment observers is another factor that could help limited health personnel at each clinic. Through the clinic activity, PPTI also schedule nutritious food supplement to patients and their treatment observers. A great success is that PPTI has valid data for individual cohorts on a quarterly report basis. This fact will support the Revised NTP in the expansion to other health services than health centers (including hospital). Through increased commitment we got; we are now on the way to strengthening the existing implementing health units and to extending our program to the other health units like hospitals and private clinics. Using the momentum of World TB Day 1999, the Minister of Health declared "War Against Tuberculosis" and launched a "National Tuberculosis Control Program" to be implemented nationwide. My story with tuberculosis control started in 1983, after I was appointed as a chest doctor in the chest disease department of Republican Hospital in Taiz. 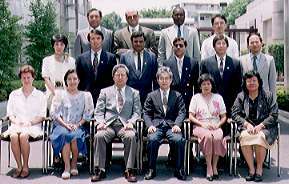 In 1986 I was given the opportunity to participate in the Advanced Training Course of TB Control in Kiyose. In reality that course changed all my thoughts and opinions regarding TB control. Following my return home, I started to work according to the new policies and strategies of TB Control learnt in Kiyose. I decided to be more effective and fully involved in TB control in my governorate in Taiz first, then in my country. In 1987, MOPH appointed me as Governorate TB Coordinator of the Taiz Governorate and Manager of its TB project through Japanese assistance. I started to work hard and to plan TB control activities at the governorate level. From 1987 to 1992 I expanded TB control to cover 21 Health Facilities in rural areas of the Taiz Governorate. In addition to that, I made an effort to run a TB sub-center and TB ward (120 beds) well in Taiz City. At first, we applied DOTS strategy by hospitalization of pulmonary smear-positive TB patients. We achieved good results. The cure rate was 75% and default rate was less than 10%. In 1992, MOPH appointed me Manager of the NTCP in the MOPH in Sanaa. When I started my new job in the MOPH the cure rate was 40% and the default rate was more than 40%. Also, TB control services were limited only 22 health facilities through the country. From 1992 to 1995, I tried to expand TB control to cover more Governnorates and health facilities. During 1995 I participated in the regional meeting of NTCPs Manager organized by WHO/EMRO. The DOTS strategy was in the beginning stages of being shared. I came back and I discussed the strategy with colleagues. Some of them welcomed the idea of starting its implementation. However, most of them totally refused. In September, we started DOTS implementation in Taiz, then expanded it to the other three major cities, Aden, Hodeida, and Sanaa. During the first implementation and further expansion stage, WHO and JICA strongly supported us. We actually, covered 52% of Yemen's population using DOTS. By end of 1998, 68% of detected smear-positive cases were under DOTS. We achieved an 81% success rate in treatment and the defaulter rate decreased down to 10%. We are now planning to achieve DOTS ALL OVER Yemen by the end of 2001. The good results achieved in Yemen in the last few years are due to major and serious efforts by NTCP and by strong government commitment regarding TB control, especially in the area of drug provision and technical assistance from WHO. We still have some difficulties and obstacles which, we are sure to overcome together with our partners. Finally, I sincerely pay tribute to those who have devoted their lives to fight tuberculosis and to reduce the human sufferings from this disease. The 11 participants of this course came from 10 different countries belonging to 3 continents. The exchange of experiences and viewpoints will contribute to strengthening our program. This distinguished course was full of activities: academic, practical, and social. However, the most impressive event was meeting with Her Imperial Highness Princess Akishino. We shall not forget her intelligent comments and wide knowledge. I feel that this course will enable us to develop our abilities in managing our own national tuberculosis programs. I would like to express our deepest gratitude and appreciation to the staff members of RIT. Arigato gozaimasu. We feel like we were the best group of trainees because it took us about 4 months to understand each other's unique personalities. 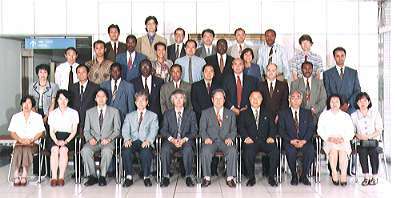 This tedious process started on June 16, 1998 wherein we, the JICA trainees, came together into one cozy room of the Hachioji International Training Center. Our group came from 21 different parts of the world. We learned unique but useful Japanese words and phrases in preparation for our memorable stay in Kiyose-shi. Through constant sharing of experiences in Tuberculosis Control, we were successful in establishing strong friendships based on patience and respect for one another. During our time together, we heard competent lecturers, attended fruitful workshops and enjoyed meaningful presentations given by each participant. Indeed, the training course was excellent and well managed! We also experienced several social activities during our stay in Kiyose which we will always cherish in our hearts and minds. I personally will never forget the football match that we played. Actually, it was "Japan against the rest of the world". We enjoyed doing daily shopping at Saty or Seiyu Department Store. We also became efficient and effective chefs! All of us are returning home with a common goal to achieve -- to control the spread of the Mycobacterium tuberculosis in our respective countries. This deadly "genie" must be put back in the bottle through the implementation of DOTS, "The Golden Key to Global Control of Tuberculosis". Of great encouragement was that DOTS has proven successful in every part of the world. I want to express my sincere gratitude to JICA and RIT staff for ensuring our stay in Japan, and for making it a comfortable and memorable one. I also wish all my colleagues the best of luck in their task of improving the TB program in their respective countries. Hoping to see you again in the near future! Iroiro arigato gozaimashita. We came from nine different countries with a common concern over TB in our countries. We looked toward acquiring knowledge on how to combat the TB problem and we were not in anyway disappointed. During the three months that we stayed in RIT we received knowledge and education from some of the most experienced lecturers who were very willing and eager to share with us in the form of lectures and practicals. All of us, both experienced and less experienced in TB lab work, found the lectures and practicals quite enlightening and educational. We learned a lot of new things related to laboratory services in the TB control programme which we did not know before. In addition we had study tours to other areas of Japan during which we learnt a lot about the Japanese health sector, especially regarding TB and lab services. We would like to pass our appreciation to all those people who warmly received us in their departments and made time despite their busy schedules. Apart from academic life, we also had a wonderful social life in Kiyose which shall forever be remembered. The home stay with the HIPPO club was a very memorable experience and we shall never forget the Higashikurume International club. Even though language was daily communication barrier, the kindness of Japanese people was beyond description and is a lesson to us to treat people who come to our countries with the same kindness regardless of grace. 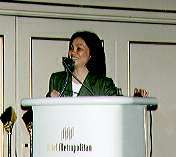 This experience would not be complete without the mention of our much experienced, wonderful course director, Ms. Fujiki. The knowledge which she willingly shared with us shall be a heritage not only to us but also to our countrymen as we shall use it to control the TB epidemic and to educate our fellow workers. Minemura-san, you were always there as a parent, a friend and sometimes as a colleague. You shall forever be in our hearts, keep on smiling. This also goes to Hasegawa-san and all the RIT staff -- thank you. No one can pass through the RIT dormitory and forget to mention the parental presence given by Ito-san and his wife. Whenever we came back from a late event we were always sure to find Ito-san waiting for us by the window. Their care for us is what made our friendship, the laughter and the knowledge that we shared special. The International Training Course on HIV/AIDS Prevention and Care in Asia is a yearly event. This year 22 participants from 16 countries with different languages, cultures, traditions and course expectations joined with the one goal of assisting in the prevention and control of HIV/AIDS. The participants felt that they were certainly privileged to be chosen as representatives of their respective countries by the Japanese Foundation for AIDS Prevention (JFAP) through collaboration with the Research Institute of Tuberculosis (RIT) and Ministry of Health, Japan. Meticulously chosen study themes such as Basic Epidemiology, Psycho-counseling, exposure to health institutions, and talks with HIV positive people enriched their knowledge and skills. It was also a time for participants to establish friendship among themselves and to learn of current HIV/AIDS situations and trends, concerns, and political as well as social issues regarding HIV/AIDS. Participants also had opportunity to visit scenic places in Japan that gave them opportunity to know more of Japanese life and culture. This course, deepened participant's awareness that AIDS is truly a global challenge. The absence of either a cure or vaccine for AIDS impressed upon participants that joining their hearts and minds and efforts could somehow prevent and control the rise of the AIDS epidemic. Participants also shared the belief that the battle is not with people with HIV/AIDS but the virus itself. From the delegates' hearts they say "DOMO ARIGATO GOZAIMASU!" They are looking forward to be returning Japan someday. Each period of three international training courses has changed since FY1999. from early May to mid-Aug.
from mid-Jan. to end of Feb.